In 2000, a year after I began researching my family history, I was on vacation at my mother’s in Ohio. During that trip, I realized that I should make sure I had a copy of my birth certificate in case it ever came to pass that I could travel with my husband out of the country requiring a passport. 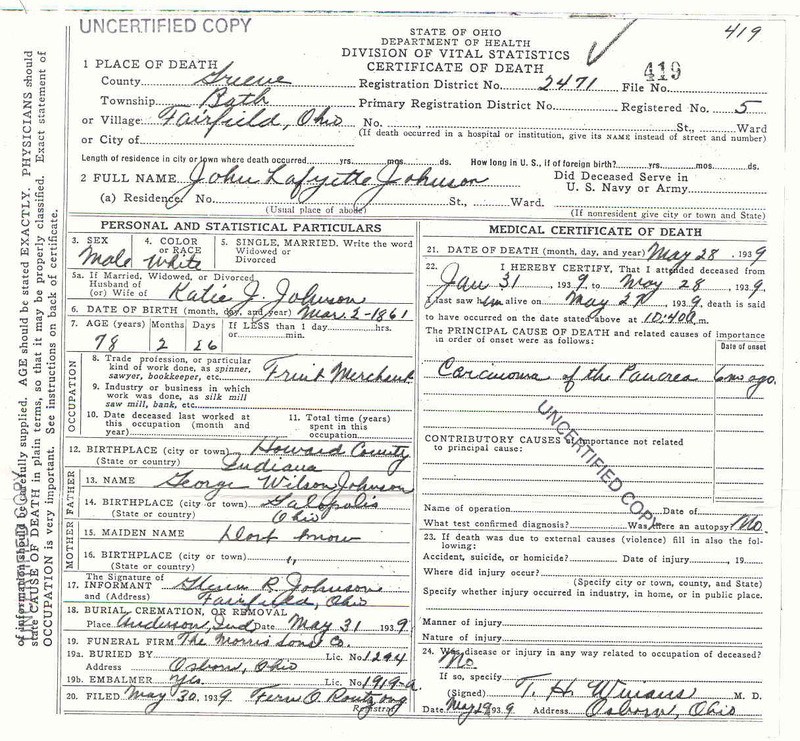 When I was at the Health Department in Xenia, Ohio – county seat of Greene county, I asked if it would be possible to purchase (cheaply) an uncertified death certificate for my maternal grandfather. After all, what would a genealogist (even an amateur one) be without a real document? The lady at the counter was very helpful and produced a copy for me. 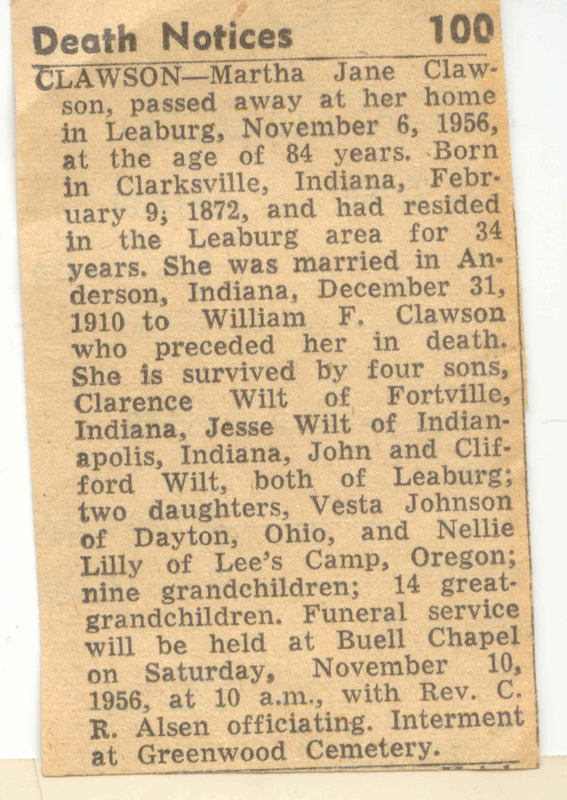 When she asked if there were any other relatives that had died in Greene county, I realized that I could also get my great-grandfather’s death certificate as well. (I could have bought more but I couldn’t remember dates off the top of my head.) I especially wanted that one in order to get the name of his father. Sadly, I had a lapse in judgment as the information on a death certificate is only as good as the memory and knowledge of the informant. The document was stamped UNCERTIFIED COPY – this could not be used for official documentation to receive compensation, benefits, or for legal matters. It does not have a raised seal. Under place of death – not to be confused with where the decedent was living – the information is recorded as to County: Greene; Registration District is 2471. Under section 3709.01 of the Ohio Revised Code it means a “city or county health district” (Ohio Administrative Code, Chapter 3701-5 Vital Statistics). The file number is 419 (used for file management). The township is listed as Bath, Village as Fairfield (this location and it’s neighbor, Osborn, merged in later years to become the City of Fairborn). The city is left blank because it was an incorporated area. The Primary Registration District is left blank indicating that the Registration District was the only one and not part of another. The Registration Number is 5 (used for file management). The fields pertaining to an exact location of death (house number, street, ward, hospital) are left blank. The length of time at the death location is also left blank. If the location had been filled out, it would have listed my grandfather’s address as well as the time of 9 years at the location. How long in the U.S. if foreign birth was not complete because he was born in the United States. The fields asking about military service are not filled in – either because the informant (my grandfather) was not asked or the answer was no so it didn’t seem pertinent to fill it in. Full Name of Deceased is listed as John Lafayette Johnson. I was pleased to see this because so many death certificates have initials or no middle name. Residence/Usual place of abode was also not completed. Had it been, it would have listed my grandfather’s address of 40 Ohio Street in Fairfield, Ohio. 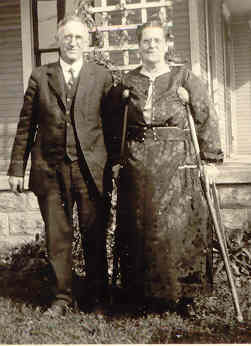 Single, Married, Widowed, Divorced: Left blank (he was widowed as my great-grandmother had died 9 years earlier). I don’t know why that wasn’t filled in. Date of birth: March 2, 1861 (hoping my grandfather knew his father’s birthdate). Trade, profession, or particular kind of work: Fruit merchant (he owned a truck that he used as fruit vendor). Burial, Cremation or Removal – Place: Anderson, Ind; May 31, 1939. 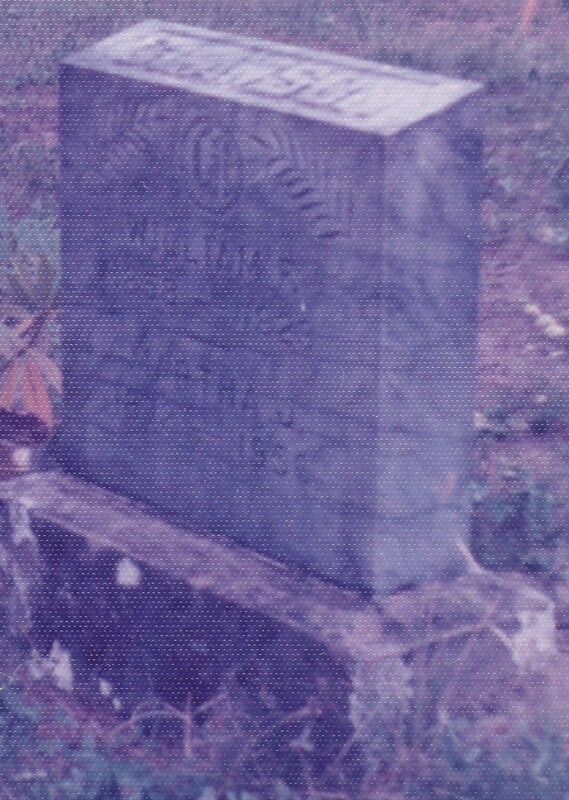 This indicates that my great-grandfather’s body was to be taken to Anderson, Indiana three days after his death and not buried in Ohio. Funeral Firm: The Morris Sons Co. The physician reported that he attended the deceased from January 31, 1939 until the date of death. The physician last saw the deceased alive on May 27, 1939 – the day prior to his death. There were no contributory causes listed. The section for injury, etc. is left blank. During the last few years of my mother’s life, I would casually glance through boxes she had stored in her basement, closet space over the stairwell, and in the closets of the guest rooms knowing that someday my sister and I would have to figure out what to do with all of those items. For a good number of years, after my grandparents had passed away in the early 1980s, there was a big box in the furnace room in the basement that contained dry cleaning bags my grandmother had saved as well as wrapping paper that had been ironed in order to re-use it time and time again. I would just shake my head. My sister had asked her once if she could do something with some of the stuff, but my mother grew anxious so nothing happened. By the time we knew the end was near, my sister and I had already resigned ourselves to taking a good amount of time just to clean out the house. One wouldn’t think that there is that much room in a three bedroom townhome with a basement. One would be very wrong! Mom had lived in that home for 32 years. Between everything she had accumulated and kept throughout her life, she also had items from my grandparents’ estate as well as things that had belonged to me that I never could find or thought enough about to take. There were knick-knacks my grandparents had bought while they lived in Europe, items my mom had brought back from living in Japan, tons of photo albums (hers and my grandparents’), tons of record keeping paperwork, and genealogical treasures! Since both my sister and I did not live in the same state as our mother, we were far from our homes at her side when she passed away. Neither of us had our husbands with us, except a brief period of time (memorial service), and even though we had cousins close by, that just wasn’t the same. Mom had a reverse mortgage so we knew that time wasn’t on our side. We had to get everything taken care of before the broker figured out that she had passed away and came to collect their money or forced a sale. Funds were low but we were lucky that it gave us not quite a month to get everything done. Those few weeks after Mom died, it seemed there was blow after blow which compounded the grief and anxiety. There was no legal will which meant we had to find an attorney quickly. The clerks in the Probate office of the county courthouse were not very helpful. They wouldn’t even tell us which forms we needed but instead told us that they could not give legal advice. Amongst planning the Memorial service, finding an attorney, and dealing with our grief, we managed to contact the correct agencies to remove the items that had pertained to Mom’s care: oxygen tanks, lifeline service, hospital bed, etc. We started with one room at a time. I have heard many stories about people who can’t bear to clean out a departed loved one’s closet to get rid of the clothing, but my sister and I didn’t have a choice. Through the removal of clothes out of the closets and drawers, we shared laughter and tears. Our focus was on emptying the house. This pile was for other family members to go through in case they wanted something. This pile was my sister’s. This pile was mine. Neither one of us could really wear any of her clothes as most of them were several sizes bigger than what we wore. That only brought home the realization of just how much weight she had lost in her final months. Each day we would take at least one or two carloads to the local Goodwill. We held a “look and see” day for our cousins and family to go through items before getting rid of them – an exercycle that Mom had once used religiously; tools – which we realized just weren’t up to snuff; Christmas ornaments and other decorations; dishware; linens; and other household items. My children and my sister’s kids had already told us what items they wanted. Those were in another pile. We had jewelry to untangle and sort out. We had a file cabinet and other boxes of papers. Sitting in my mom’s walk-in closet going through items that had been in her “safe,” I found the marriage license and certificate of my second great-grandparents. I found divorce papers, birth certificates of my mom and her parents, and letters. I found my mom’s old medical records, all of her work history information, and her association memberships and information. There wasn’t time to enjoy the finds or do a “happy dance” because of the circumstances surrounding the finds. 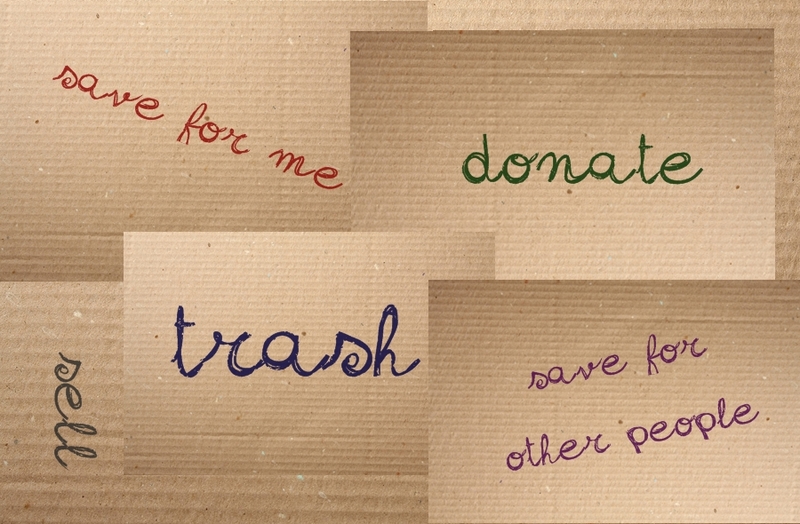 More often than not, items would end up in the trash – but they were unusable, broke, or not worth taking to Goodwill. Items we were taking with us were packed which meant we had to find boxes. In between the attorney, Goodwill, and cleaning out the townhome, our cousins made sure that we were fed by having us over for meals or taking us out to dinner. When we ate at the house, we spent time coming up with meals out of all the canned goods and freezer items. Though my sister had to leave before I could, we had most of the house cleaned out. The furniture was over forty years old but we tried to contact people in the phone book who advertised that they bought and picked up old furniture. Apparently, it either wasn’t antique enough or vintage enough. By the time my husband came to pick me up to bring me home, the house was as stripped as it could be. The master bedroom suite was still left – it was such a shame as the dressers were still in beautiful shape. The appliances were left – washer/dryer, refrigerator, microwave, and range. The living room end tables, couch and chair. All of the consumables, clothing, linens, decorations, etc. were gone – either to family, Goodwill or trash. We knew what Mom’s wishes had been as to who got what (which would have been really nice had it all been spelled out in a legal will instead of one of those “do-it-yourself” booklets), so we were able to make sure items went to those people she had specified. At one point, the attorney was all upset because I was taking one of the televisions (I think he was afraid that it wouldn’t be there to sell in order to get more money for his fee) until he found out it was an old television that even Walmart wasn’t even selling anymore. Now, five years later, I still haven’t had much time to do the genealogy “happy dance” about some of the items I found at that time. I am, however, enjoying quite a few items I brought back from Mom’s – dishes and utensils. I enjoy the knick-knacks that had belonged to both my grandparents and my mom. In many ways, I’m glad that we had such a short amount of time to do an estate clean out because it kept me focused on a goal instead of spending days in a grief-stricken fog. I had a plan and needed to follow through. Preparing to write this blog post, I came across several other blogs from people who have had to deal with this same thing. Each one gave tips on how to make it easier such as trying to downsize prior to a loved one’s death. Sometimes this is inevitable if the person needs to be moved to an assisted living facility, nursing home, or a long term care center. Other posts advised to “let it go” and that is easier said than done. Parting with some items were much easier than others. I was aghast that no one wanted the wooden, carved desk plaque of my grandfather’s name. It had sat on his roll top desk for as long as I could remember. So I took it. I still have it. I don’t have a clue what I’m ever going to do with it. That was probably something I should have just “let go.” I have huge (and I mean huge) pictures – some sort of photographs – of my grandfather’s family when he was a child. I’m never going to have a place to hang them. Who would want to sleep in a room with huge photographs of these people staring at them all night? But I had never seen them and being the family historian that I am, I had to have them. The advice of “pace yourself” is laughable. That would be good advice if the house had been paid for (not on a reverse mortgage) or even in the same city, county, and state (it wasn’t). It’s hard to pace one’s self when time is not on your side. For me, it was about keeping some of the items “in the family” – didn’t matter if it was my sister or her kids, my cousins, my nephew, or me and my kids. My OCD was that I knew where it was. That was from years of hearing my mother say things like: “It better stay in the family” about certain things or her being upset when something had been given to someone and then they sold it/gave it away without asking. I know, that sounds rather selfish. “Here you can have this but don’t you dare do anything with it even though now it’s yours to do with what you want, unless you ask permission first” – that’s what it sounds like. So rather than incurring my mother’s wrath from beyond the grave, I became a little OCD that way. Don’t judge! For others, the only bits of advice I will give are these: make sure your parents (and yourself) have a legal will so that way everything that they (or you) want to have happen to your belongings will be done; do it the best way you can – slow, fast, with other family members, alone, cry, laugh, and remember. For in the end, it’s the memories and time spent with the loved one that matters the most – not the stuff. Saying goodbye to a loved one is never easy and even harder when that person is the one who bore you and gave you life. I had known for awhile that my mother had cancer and not only that, she had heart problems and COPD. As an adolescent and even a young teen, I was well aware of my mother’s mortality. She would ask that if something happened to her, who would I want to live with. My first answer was my grandparents but she reminded me that they would probably be gone before she was, and even if they weren’t, they wouldn’t be in very good health to raise a young person. It seemed like every time my mom got hurt – whether it was spraining her ankle on a curb or falling down the concrete steps where she worked or even when it seemed she just didn’t feel good for one day longer than I thought was right – I felt a sense of panic. But time marched on, and Mom always bounced back from whatever it was that happened. I moved away and became independent, got married and had children, settled into a nice career, and even turned my life around after my divorce. Back home, Mom was settling into her own life – one without the strains of an angst ridden teenager living under her roof. She found new friends and went out on dates. She became even more active in her church and the many other organizations to which she belonged. Her life didn’t revolve around me anymore. I was happy for her. After my grandparents passed away, she had even more time to indulge in what she wanted to do. If she wanted to spend the day sewing, she did. If she wanted to watch the Master’s Golf Tournament from start to finish, she could. If she wanted to travel, she did. Somewhere along the line, I forgot that my mother was forty years older than me; forgot that she was getting older before I hit middle age; forgot that her mortality could knock on the door at any moment. Then in 1998, Mom had surgery to repair leaky heart valves brought on from a bout of childhood rheumatic fever. My family had already planned to be at my in-law’s 50th anniversary celebration so we traveled all night to get to Missouri, but I was not going to sleep until I knew the outcome of the surgery. All day I waited for my brother to contact me but still no word by early evening. Nerves on edge, I played phone tag with him but managed to talk with Mom’s doctor who let me know that she had come through the surgery okay. What a relief – then I slept. It took her time to heal, but she did. She continued to work full time even as she was approaching 80 years old. It was about then that I realized Mom might not have a lot of time left on this earth. We tried to visit more often. 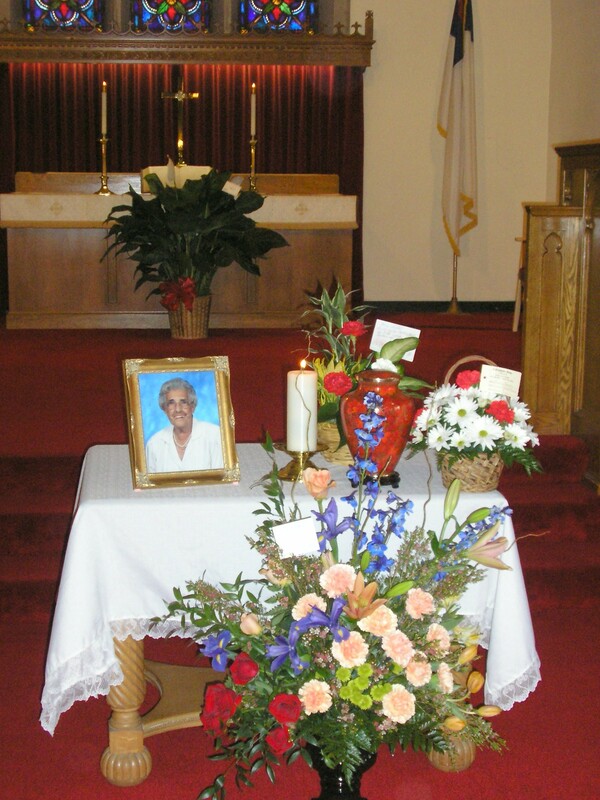 In June 2001, her brother passed away and in August 2001, my brother passed away, and my mother was inconsolable. She kept saying that she wouldn’t be far behind. I was afraid that my brother’s death would cause her mental and physical health to decline rapidly but she was stronger than I thought. Mom pressed on knowing that life does not stop. Due to unfortunate circumstances, she was let go from her job. I always thought that if she didn’t have a reason to get up in the morning, that she would probably call it quits. But she made due with the hand that had been dealt. Several years later, she had to have another surgery but due to the blood thinner she had to take and lack of attention by medical personnel, she began bleeding internally. It was then that I realized that she wouldn’t be able to handle any type of surgery – major or minor. Her blood pressure was getting lower. Her heart valves were starting to leak again. She started having breathing issues and congestive heart failure due to fluid around her heart. After testing some of the fluid from her lungs, they discovered that she had lung cancer. Surgery wasn’t an option for her so they gave her the chemo pill. She had good days and bad days but she always did her best to go to church each Sunday and drive to doctor appointments or to her friend’s home. It was such a blessing that my cousins were close by and if need be, one of them always helped her out. Being 900 miles away that knowledge helped ease my anxiety about her situation. She had a couple of TMI’s (also called “mini-strokes”) but she’d be okay after a couple of days. Her oncologist had put her in touch with hospice because there are several things that organization can help with even if it’s not at the end of life. Mom got a lifeline in her home so if she needed it, help was just a “holler” away. She was on oxygen all the time. Even though she could and still did cook for herself, Meals on Wheels delivered meals to her a few times a week. That would help on those days when she really didn’t feel like preparing food just for herself. Each time she had a spell that sent her to the hospital, she would have to go to a rehab for a couple weeks afterward so they could make sure she was able to take care of herself. She’d get so frustrated. 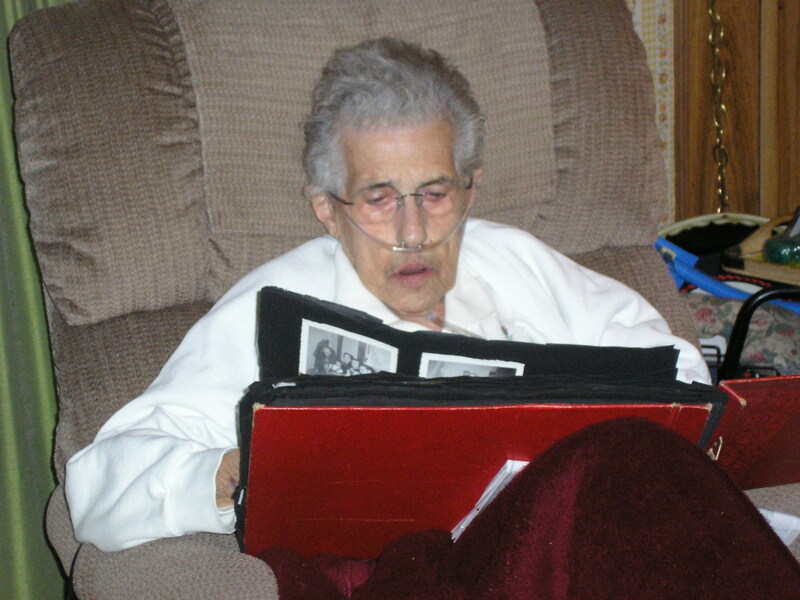 When my family visited in June of 2008, I kept watching her to see if I could tell how she was doing. It was probably to ease my mind. I went to the doctor with her. Not at any time did they ever give her a time limit. There was no one year or six months or anything. She kept taking the medicine she needed – especially her blood thinner and her cancer pill. She knew what she could and what she couldn’t eat. She knew if her oxygen was turned too low or too high. Walking out of that house to return to Texas after our vacation, I hugged her with the thought in the back of my mind that it might be the last time. That November, my sister and I made a special trip to visit her. It was the first time in many, many years that Mom, my sister, and I were under the same roof for several days. We had a lot of laughs and made some good memories. I dug out really old photo books that Mom hadn’t seen in eons. As my sister and I looked at all the stuff in the house, we knew what a task we would have one day. Mom would get too anxious about throwing stuff away so we didn’t. By that fall, she had lost a lot of weight and was looking frail. She got cold easily so she always had a blanket around her and several tissues ready to catch the drip of her nose due to the oxygen. I can still here her cursing her nose! She’d cough and couldn’t quite get it all up and out. By March 2009, Mom would tell me at least a couple times a week during our daily phone calls, that she wondered if it was all worth it. I think she was getting tired. All I did was pray harder. Her back would hurt where the tumor was. It was hard for her to get comfortable. She was continuously losing weight. But she was still driving where she needed to go. She had gone to the hair dresser and when she got home, two nurses came to visit. They asked her if the doctor had told her how much time she probably had left. Mom said no so they told her that they didn’t think she had longer than six months. Well, that threw her into a tailspin. They kept pressing her as to where she would want to go – what nursing center. Mom adamantly wanted to stay in her home of over 30 years. My sister and I discussed it, and one idea was for my mom to go ahead and move to Texas and live with my sister. Both she and I started researching places where my mom could be treated on her Tricare (military dependent) insurance, oxygen companies, hospice agencies, etc. We both knew that even though Mom agreed to that, she really didn’t want to leave her home or her companion or her friends and the family that was in Ohio. My sister made other arrangements to move up to Ohio on May 2nd and stay with her as her caregiver until the end. I think I could hear Mom’s sigh of relief that she wouldn’t have to move. Not long after, she had another bad episode of internal bleeding, and my cousin got her to the hospice hospital in Dayton. Not knowing what was going on or if the end was near, my sister and I loaded up and took off for Ohio. Luckily, my husband was supportive and did everything he could at home to help with our grandson and his getting to and from school and other tasks that needed to be done. My other children also pitched in to help – whether it was picking my grandson up from school to making sure his homework was done to giving the house a thorough cleaning to cooking the Easter dinner because I was gone – it all helped so I could focus on my mom. When we left, we didn’t have a time table on when we’d be back. We were there over Easter 2009. Mom was even more frail than when we had seen her in November. She was down below 100 lbs and had aged about 10 years or more. Sometimes she said something that didn’t make a whole lot of sense – things that were relevant 20 or 30 years before. She told us that she didn’t want to linger in a comatose state like some of the other patients there. She was so worried about that. She wanted to be at home. She wanted to die at home. We were told that she would be released very soon but she would need a place to go and someone to be there. 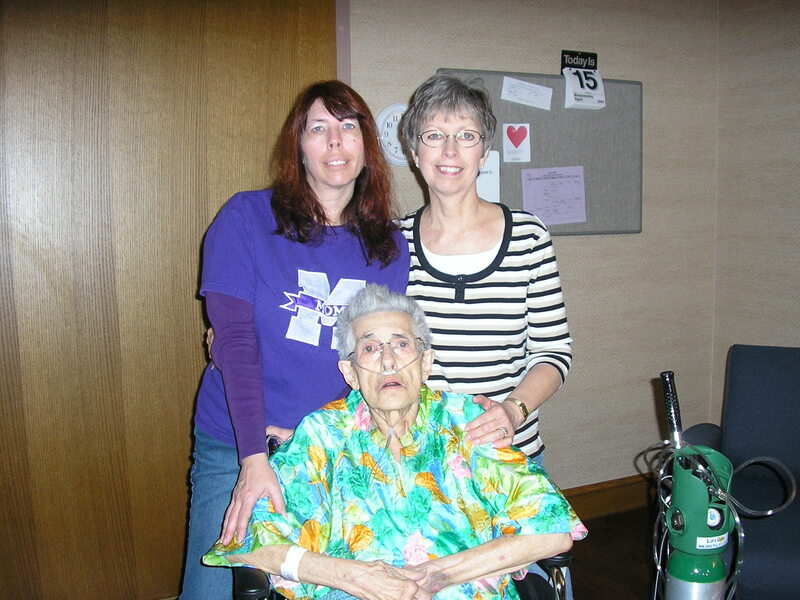 Before we left the hospital that last day, I hugged Mom as tightly as I dared and spoke only to her. I thanked her for being the best mom I could ever hope to have and for doing everything she had done for me. Then I told her that I loved her so very much. It was the last time she reached out to hug me back and give me a kiss goodbye. My sister drove me back to Texas, and then she loaded up her dogs and clothes and went back to take care of our mom. She arranged for a hospital bed to be waiting on mom when she was released. They had told us that they didn’t think she would be with us in three months. Mom went downhill very quickly after she got home. Each day when I called, my sister would give me the update, and then I’d talk to mom. 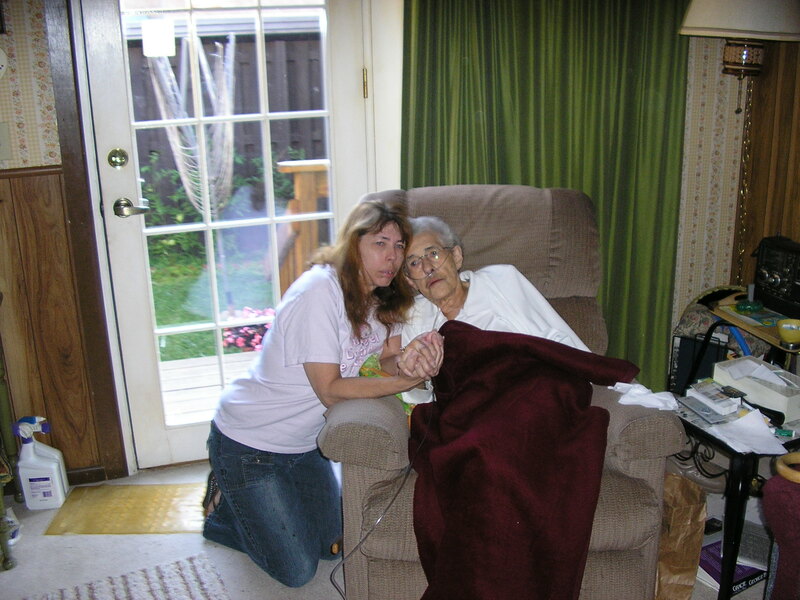 On April 28th, my sister told me that the hospice nurse didn’t see that Mom would make it past the weekend. What was my plan? I decided to fly out on April 30th for Ohio. That happened to be my grandson’s birthday so the day before we had a mini-birthday for him and then very early the next morning, I caught a flight out. I heard her voice for the last time that evening. I told her I was coming. She kept calling me by my sister’s name (well, she’d done that my entire life!) but my sister got her to say my name and told me that she wanted me to hear Mom say my name. Mom had been calling my sister by her sister’s name and talking as if she was back in the 1940s or 50s. My sister had hardly slept as Mom had been trying to get up in the middle of the night, and it was all my sister could do – even at my mom’s 97 lb weight – to hold on to her so she wouldn’t fall down and get her back to bed. I didn’t know what I would find when I arrived. Would she still be alive? She was. Would she still be alert? Not really. How much time would there be left? Not much. All afternoon and evening after I arrived, friends, relatives and the minister came by. Hospice nurses switched shifts. My sister and I talked to Mom. She began to really “go away” that evening. We talked of how she didn’t want to linger. We had to let her go. I didn’t sleep that night but my sister said she got a good night’s sleep. I sat next to Mom’s bed, holding her hand, listening to her breathing, and just making sure I could remember how her hands felt – soft – and that she was near. The next day dawned, and she was still with us. More relatives came by. People called on the phone. We all told her that it was okay for her to move on, to go to our grandparents, her sister and brother, and our brother. My nephew drove in from Texas. I called family members and Mom’s special gentleman friend and told them they had to tell her that it was okay to let go – that it wasn’t fair to her for them to hang on to her. I’d put the phone by her ear and pray that she heard their words. That evening, I told my sister I was going to try to nap for a bit but to wake me just in case her breathing changed. It wasn’t long before she roused me. She, my nephew and I sat with her and told her goodbye. My sister told her that it was okay to fly away like a butterfly, and then she took her last breath. Amidst the tears, sorrow, and grief, we helped bathe her, brush her hair, put lotion on her, and then called the relatives who wanted to see her one last time before the funeral home came for her. In the days that followed, my sister’s husband and my husband and family arrived, final preparations were completed, a memorial service was held, and then our husbands and families left. We still had the interment to follow a week after the memorial service. We still had a house that needed to be cleared out and readied for sale. We had an attorney to find in order to start probate – and without a legal will – that was absolutely the worst thing to endure while going through the grieving process. There were times I just wanted to go off on whoever was giving me an attitude – in fact, I did at a clerk in the probate office who kept pointing to forms when I asked her what I needed to do. There were times that I didn’t want to have to pack the car just one more time for one more trip to Goodwill. There were moments I wondered why we had never made sure she had a legal will. 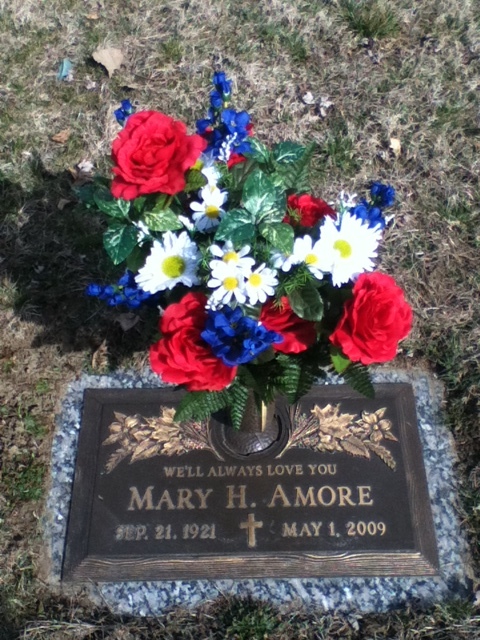 After cleaning out the house – which made it practically impossible to give in to grief – and having our cousins around trying to provide some sort of support for us, my sister went back to Texas after Memorial day – after we had ordered Mom’s gravestone. I had to wait a couple more weeks until my grandson was out of school so that my husband could drive to Ohio to pick me up – along with renting a U-Haul truck and being loaded down in my van with stuff to bring back to Texas for my sister, niece, nephew, and my own kids. It still took almost two years for Mom’s estate to be probated and her home to be sold. Until then, it seemed as if every communication from the estate administrator or the attorney was like ripping a bandage away from a wound. The sorrow and grief were always there – not to mention a bit of anger that Mom’s wishes were not being carried out the way she had meant. On what would have been her birthday the fall after she passed away, I was busy waiting on my grandson to be born. For my sister, it was a very difficult day. Mom never knew that she would have a new great-grandson, but I knew that she was probably arranging his birthday to be the same as hers after she was gone. During one moment when I had sat with her alone, I had asked her to indicate her presence to me with a penny. When we were cleaning out her home, I would find pennies in the most unusual spots. In an old change purse, I found a penny dated the same year I was born. That was good enough for me. Although, in the jar marked “pennies” there were none to be found – only nickels, dimes, quarters and silver dollars! To this day, my children and grandchildren have had butterflies glide along beside them as they play or light on their hands and arms – just sitting for a few moments. We always say that Grammy (what mom was known as to her grandchildren and great-grandchildren) is nearby. And now, five years has gone by since she’s been gone. I dreamed about her several months ago – a dream that wasn’t a memory of something that had happened earlier in my life. It was a dream that she was real and was standing in front of me. I was able to hug her and feel her. 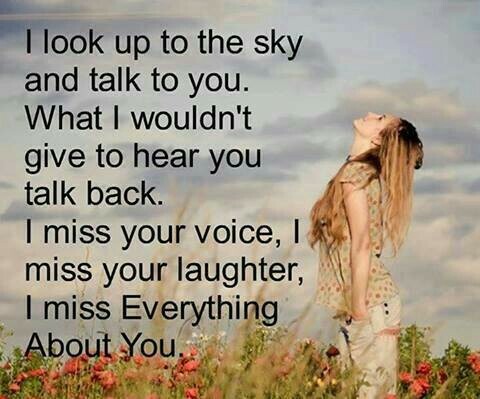 It was comforting to know that my mother’s arms are still around me even if she’s not physically with me anymore. The dishes that once belonged to her, I still use – but only for the same thing she used them for. One bowl is only for mashed potatoes. The top part of the large double boiler was only used to heat up soup. I am so lucky to have digital recordings of her voice so I can still hear her. I have some old videos so I can still see her in motion. I have letters that she sent to my grandparents in the 1950s when she lived in Japan so I can read her words and know her thoughts. And I have photos – tons of photos. Each year my sister and I buy a silk flower arrangement for the vase on her gravestone. The cemetery leaves it there from spring until fall. And we will continue to do so until neither one of us can do that anymore. I miss our daily phone conversations even though there were times neither one of us had any real news of the day to share. Occasionally, I have to keep myself in check because I haven’t picked up the phone to call her before realizing there’s no one to call anymore. When I hear hateful words between family members, I’ve had to say that I wish I could argue with my mom but I can’t because she’s not there hoping to make someone realize that life could change in an instant. This is just a small part of my mom’s story. But it’s her final story. And whether it’s five years or fifty years, I’ll miss her everyday.